Apples In Stereo mastermind Robert Schneider has just gotten copies of his veteran indie pop band’s hot-off-the-presses New Magnetic Wonder and he can barely contain himself. Appearing: February 23rd at Subterranean in Chicago. New Magnetic Wonder is the first Apples release since 2002’s Velocity Of Sound and Schneider’s holding it up to some pretty high standards. NMW does manage to successfully amalgamate all the elements familiar to fans of the band’s well-honed, orchestrated-but-hyper psych-pop approach while adding new timbres, most notably a very Jeff Lynne-esque approach to production values, replete with plentiful use of the much-maligned vocoder. A lot of thought also went into the sequencing of the songs. 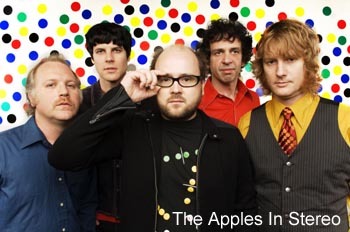 “I tried to program it so the first half of the album would be all the pop hits — like what some people would expect a typical Apples record it to feel like,” Robert recounts. “But then I made the second half more moody and psychedelic and kind of indie rock. And my feeling is that most people are gonna stick on the album while they’re driving or they’re about to go out or maybe a radio DJ’ll be checking the record for songs to play or whatever and I wanted those people to get a satisfying listen out of it — a lot of stuff that jumps right out, more poppy stuff. But then I realized the other day that it’s possible that some people may never hear the second half,” he chuckles. “They may enjoy the first half, and then they may just never make it to the second half. But maybe, eventually, they’ll let the stereo go or something and it’ll be halfway through the CD and they’ll get to hear a whole new album, almost. Hopefully that’ll happen. For more on Robert Schneider’s Brian Wilson obsession and turnaround, pick up the February issue of Illinois Entertainer, available throughout Chicagoland.